You can hardly run into a media site these days that no longer includes online video (even we are getting ready to launch TechCrunch TV). But which kinds of media sites are getting the most views? In a joint report put out today by Brightcove and Tubemogul (embedded below), the non-YouTube sites seeing the most success with online video are those of the broadcast TV networks and Web-only media brands, followed by magazine sites and music labels. Newspaper sites are lagging when it comes to both total video views and growth. In terms of how people are finding these videos, a little more than half (51.75 percent) are navigating directly from the publisher’s main site. Following that, Google search is the next biggest source of video-viewing traffic (38.92 percent), followed by Yahoo (5.58 percent), Bing (2.29 percent) and Facebook barely registers (with only 0.40 percent). 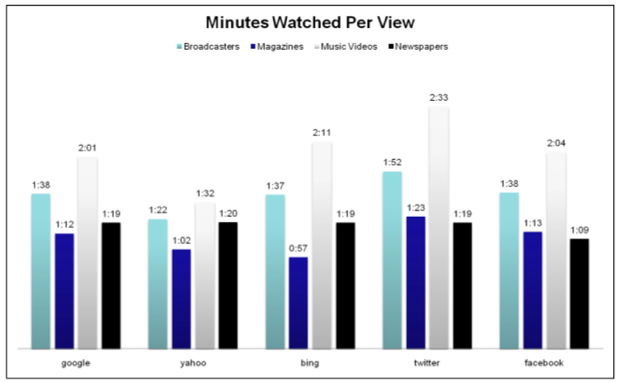 Twitter is even smaller, but people who find videos are more engaged than any of these other sources of traffic, on average watching videos longer across different media categories. In the first quarter of 2010, the Broadcast TV networks sampled in the study streamed 380 million videos, with Web media brands coming up close behind at 326 million video streams. However, the native Web brands, which include both video-only and general entertainment and news sites, saw 300 percent annual growth of video views in the first quarter, compared to 44 percent growth for the broadcast sites. 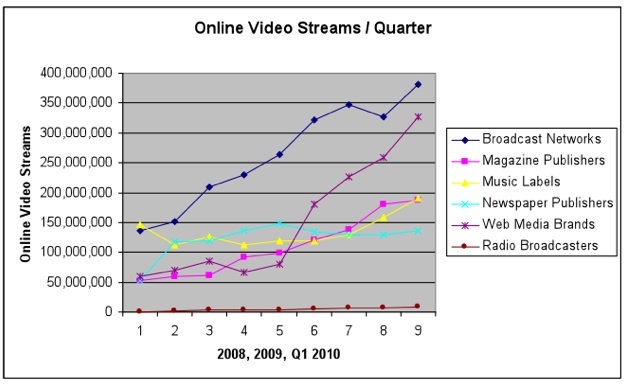 For all of 2009, Web media sites grew twice as fast as broadcast TV sites (165 percent vs. 74 percent). At this rate, they will overtake the broadcast sites in video views later this year. (The report is based on a sample of Brightcove’s media customers, and is not necessarily representative of the Internet as a whole, but directionally it should be accurate given the size of Brightcove’s video-hosting network). Magazine sites are showing some strength with their video offerings. In the first quarter, they streamed 190 million videos, up 90 percent. They are streaming as many videos as music label sites, which came in at 191 million videos, up 60 percent. Newspaper sites aren’t doing nearly so well. With 136 million video streams viewed in the quarter, they were only able to manage 5 percent growth. And newspaper sites are pushing videos more than any other type of media site, with 2 billion video player pageloads in the quarter (i.e., pages which loaded with a video player, but were not necessarily clicked on), compared to 1.2 billion for magazine sites, 760 million for Web-only media, and 670 million for broadcast TV sites. Obviously, newspaper sites are having a real problem getting their audiences to watch videos. For every 2 billion videos they throw in front of them, only 136 million get viewed (6.8 percent). Whereas broadcast TV sites are getting 380 million views for every 670 million attempts (56.7 percent). Maybe that is because people go to newspaper sites for news and quick hits, and they go to TV sites to watch videos. But even magazine sites are seeing a 12.7 percent hit rate. Again, this could be a time commitment scenario. Most people go to news sites for quick facts and breaking news. But those people who do bother to watch videos on newspaper sites, are slightly more likely to watch them to the end more than on other types of sites. 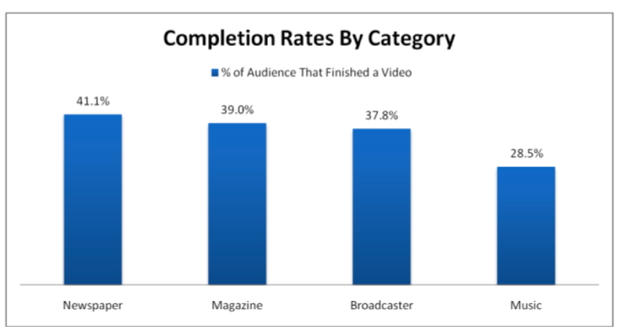 The completion rates for videos on newspaper sites are 41 percent, versus 39 percent for magazine sites, 38 percent for broadcast sites, and 29 percent for music label sites.